Champaca Absolute Oil that we manufacture, export and supply is extensively used for preparing numerous products. 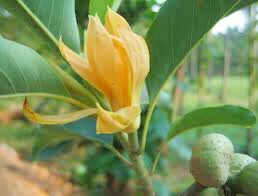 Owing to its sweet floral aroma, our Champaca Absolute Oil is used in aromatherapy, scent, etc. It is known for evoking sensuality, love and romance. Our pure Champaca Absolute Oil is available in excellent quality packaging and at very reasonable rates. We also ensure timely delivery of the orders.